I am a very lazy person sometimes. When it comes to food, it’s a lot nicer to not always have to go through a lot of effort to get a yummy treat. So, I thought I’d pass this along in a somewhat random and first ever recipe post! The best thing about it? 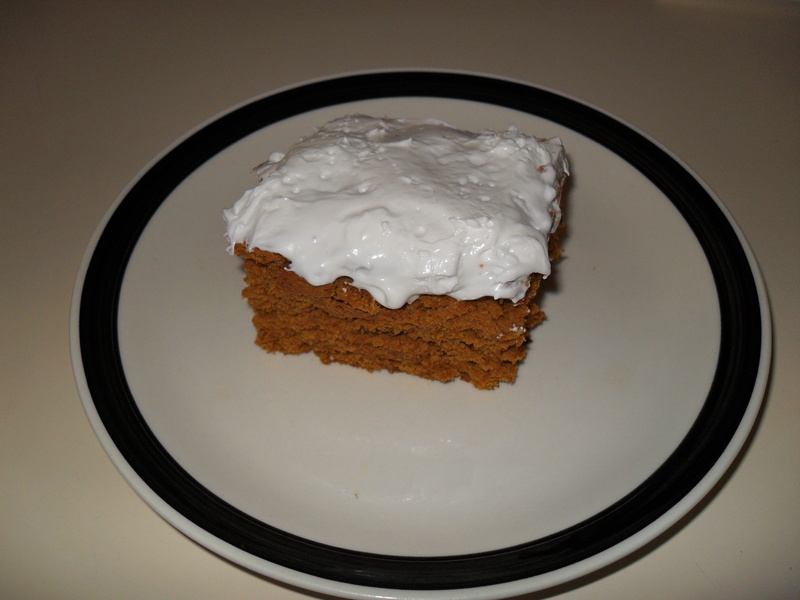 All you need for tasty pumpkin spice cake is a can of pumpkin and a box of spice cake mix. That is correct, no need of water, eggs, oil and all that other stuff the box calls for. You just get yourself a box of spice cake mix 515 g (18 oz, I think, if you swing that way) and a 398 ml (13 oz approx) can of puréed pumpkin, mix, stick it in a pan, and toss it in the oven for whatever the box calls for depending on your pan, or muffin tin size. If it’s still too moist once you do the toothpick test, cook longer and repeat test. If you want to get fancy you can toss some icing on it…et voilà!